This is a post from Chef Richard Mathis that deals with the smoked fish display he implemented at the St. Pete Times Forum this year. It is worth reading. Thank you. 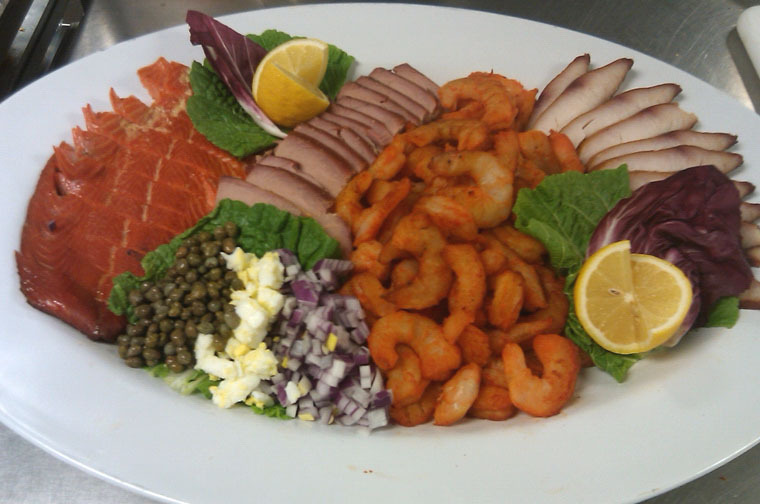 This season at the St. Pete Times Forum, we incorporated a smoked fish display which received rave reviews. I wanted to share the procedure with anyone who may be interested. 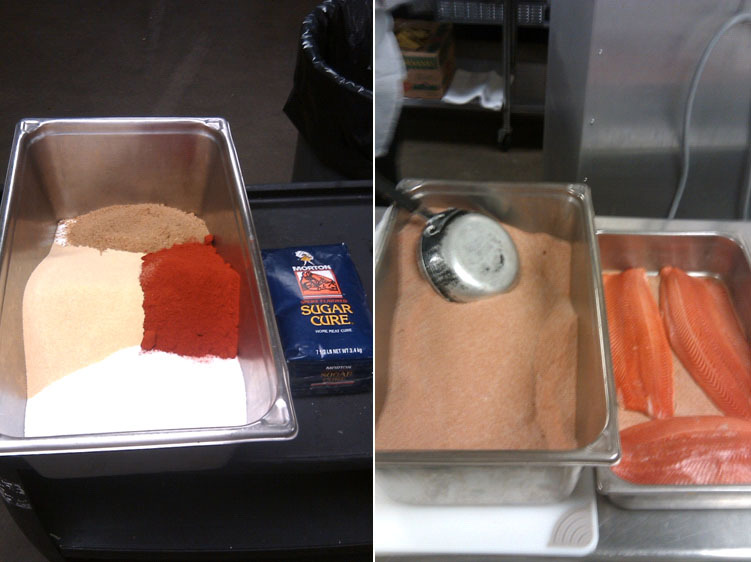 You can add your custom spice blend here to your taste as the most important part of this mix is the 2 to 1 ratio of sugar to salt… the rest is just added flavor and color. Layer the bottom of pan with Cure mixture. Cover liberally with more Cure mixture and continue layering. As a general rule… at least what worked best for me throughout the years is… 24 hours of cure per 1 inch of thickness of product. Rinse cure from fish under running water and place fish on a rack. 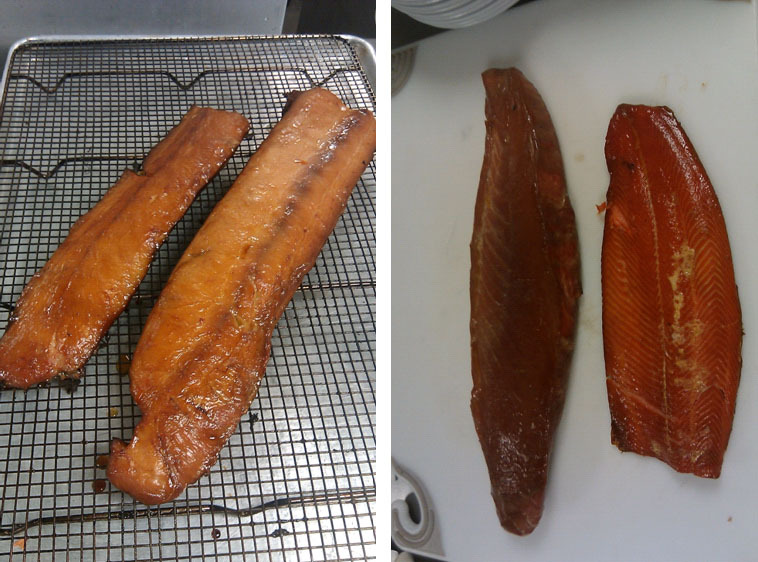 Allow fish to air dry in cooler, UNCOVERED, for 24 hours or until a nice pellicle has formed on fish surface. 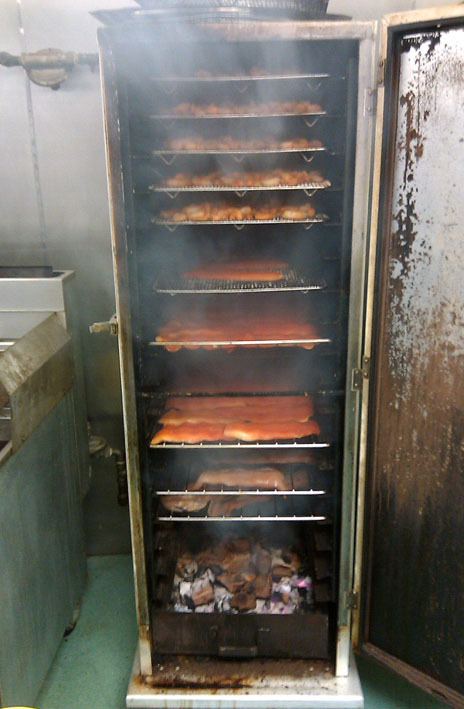 This will allow a “sticky” surface for the smoke to adhere to… notice the nice glaze on the fish in image below. Make a pyramid of charcoal on an oven rack and place over direct flame until the charcoal is glowing. Transfer glowing charcoal to bottom of smoker and add presoaked wood chips… I found mesquite chips to work the best for me here. Layer the seafood in the smoker with thicker items toward the bottom of the box as they will need more heat to cook through. This process takes anywhere from 3-5 hours. This time will be more consistent if you have a constant heat source in your smoker. I was using charcoal as my heat source so the time varied greatly. Rotate the fish if necessary throughout the cooking process. Cool thoroughly, slice and display. This entry was posted on Thursday, April 28th, 2011 at 11:06 am and is filed under Uncategorized. You can follow any responses to this entry through the RSS 2.0 feed. You can leave a response, or trackback from your own site.